For those whose property touches the river, one of the lakes, a tributary or stream, this book is for you! This updated (2010) publication offers pointers that will inform your choices for building, landscaping and managing the zone along our waterways. 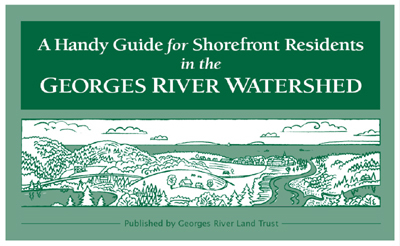 A Handy Guide for Shorefront Residents is easy to use and has reference material all in one place. The booklet discusses the importance of buffers and the role individuals can play to protect water quality and sensitive aquatic ecosystems. The Land Trust is grateful for financial assistance from the Maine State Planning Office’s Maine Coastal Program and the Maine Outdoor Heritage Fund to re-publish this book. If you are interested in a printed copy, please contact us. The Maine Department of Environmental Protection has also produced a Handbook for Shoreland Owners to help people understand the shoreland zoning laws.